Our fully customizable software suite allows you to manage your active entertainment center your way. Online booking capabilities, waivers, and booking reminders provide you with the opportunity to focus on ensuring that your guests have an excellent experience at your adventure center. Manage everything from parties and employees’ schedules to point of sale transactions and online ticketing on our easy to navigate software system. The first impression your customer will likely have with your entertainment center will begin online. The Active8 system is built to ensure that your customers are able to easily navigate through the system and complete everything they need in an expedient manner. Our integrated waivers allow your guests to complete waivers online prior to enjoying your trampoline park, climbing center, or other active entertainment venue. 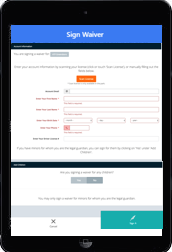 Guests who choose to complete their waiver after arriving at your facility can complete the check-in process quickly on any smart device. All waivers are stored on the customer’s account for easy access and record keeping. Expedite your check-in process with our intuitive waivers that are integrated into the check-in process. Customers are able to complete their forms quickly with driver’s license scanning and parents can sign for the entire family all at once. Take the hassle out of managing schedules with our integrated time clock and employee scheduling. Employees can access their schedule from home and post requests for schedule changes, while managers are able to review and approve employee requests. Intuitively designed to ensure that employees can focus on customer service our point of sale system ensures that guests are taken care of in an efficient manner. Manage the till with integrated cash controls, produce bar-coded tickets and receipts, and complete customer check-in quickly with our fast-scan customer check-in process. Manage parties and events efficiently while improving the custom experience with tableside party check-in and tableside waivers. Active8 provides a single solution for the needs of your entertainment center with the utilization of a single credit card system for web, mobile, and point of sale. Our web-based service is secure and backed up automatically. If an issue arises you can rest assured that the Active8 support team is available twenty-four hours a day, seven days a week.